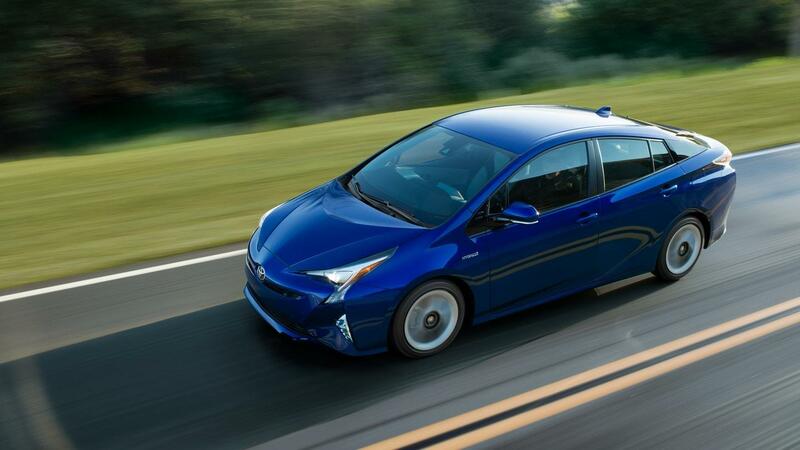 It may be hard to believe but the Toyota Prius debuted in Japan over 20 years. And in those years, the Prius has been continually refined to better meet customer requirements. For 2018 the fourth-generation Toyota Prius remains the leader in hybrid fuel economy. The 2018 Prius Eco model received an EPA-estimated fuel economy rating of 58 mpg city, 53 mpg highway, and 56 mpg*, which is greater than any other mass-produced passenger vehicle that doesn’t require plug-in functionality. Despite its still compact exterior, the interior volume has been expanded so it now qualifies as a mid-size car according to EPA standards, despite the fact that the new Prius is just 2.4 inches longer, 0.6 inches wider and 0.8 inches lower than the previous generation. Offered in seven distinct model grades ranging from One to Four, with an Eco and two Touring variations, the Prius range meets a wide variety of tastes and needs. The latest version of the Prius Hybrid Synergy Drive combines the output of a 1.8 L four-cylinder gasoline engine and two motor-generators through an electronically controlled continuously variable transmission (CVT) with shift by wire functionality. Another source of power is the regenerative brake system that recognizes when the Prius is slowing and switches the operation of the motor to that of a generator to recover the kinetic energy as electrical power and storing it in the smaller, lighter lithium-ion hybrid battery that replaces the nickel-metal hydride battery in all models, with the exception of the Prius Two standard. The new battery’s smaller size and lower profile allows engineers to relocate the battery to under the rear seat from beneath the trunk, freeing up additional cargo space. Even the exterior contributes to the efficiency of the 2018 Prius, with a 0.24 coefficient of drag (Cd), among the lowest of current production passenger cars, which is achieved not only with the overall vehicle shape, but through details including a drag-reducing automatic grille shutter that closes when airflow to the radiator is not required, aero stabilizing fins on the underfloor covers, a smooth pattern along the front quarter windows and tail lamps keep air flowing in a smooth, drag reducing pattern. The newest Prius design, despite its more aggressive, futuristic design, provides a clearer view to the rear, thanks to larger rear door glass and larger fixed rear quarter windows. As on the previous model, a full-width glass panel beneath the rear spoiler aids rearward visibility. A backup camera comes standard on all grades. 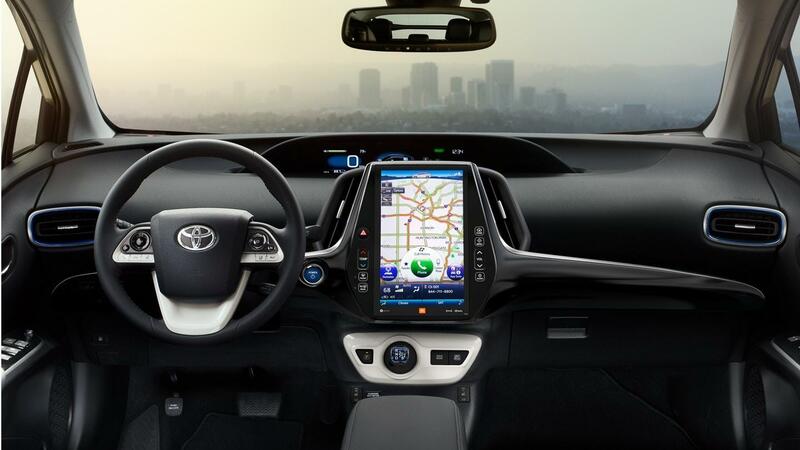 The futuristic theme carries into the Prius cabin, where a central gauge panel features dual 4.2-inch full-color TFT multi-information display. The driver can choose between Simple or Segmented display modes. Simple mode displays basic driving information while the Segmented display features more greater detail about hybrid operation. The standard Entune Audio system on the Prius Two and Prius Two Eco models includes a 6.1 inch touch-screen display, AM/FM/CD player, six speakers, and a suite of connectivity options. On all other models feature the Entune Premium Audio with Integrated Navigation system and Entune App Suite adds a 7.0-inch high resolution touch-screen with split screen display and the Entune App Suite. As part of a package, the Prius Four model offers the exclusive Entune Premium JBL Audio system with Integrated Navigation and App Suite. To all features of the two systems above, it adds 10 JBL G speakers in eight separate locations around the interior. A full array of supplemental restraint system airbags includes driver and front seat passenger front and side airbags, full-length curtain airbags, a driver knee airbag, and a front passenger seat cushion airbag. The 2018 Prius also provides standard the Toyota Safety Sense P (TSS-P) which identifies obstacles and automatically applies braking if necessary. TSS-P includes the Pre-Collision System with Pedestrian Detection, Lane Departure Alert with Steering Assist, Full-Speed Dynamic Radar Cruise Control, and Automatic High Beams. There is so much more available in the 2018 Toyota Prius that we simply don’t have enough space to cover, like its Enhanced Parking Support. So if you live in the Greeley, Boulder, Windsor, Loveland, Longmont, Frederick, Del Camino, Firestone or Dacono areas, drive into Pederson Toyota in Ft. Collins to learn about all the unique features Prius offers, and why it remains the most popular Hybrid. There our Prius experts will share with you all the innovations in the 2018 models as well as send you out on a test drive, the only true way to appreciate all that Prius offers.